Free choice of space for the safety: Mirror and device columns from SICK are used in applications where it is difficult to mount optoelectronic protective devices. Used together, mirror and device columns are the ideal solution to protect multi-sided areas in machining centers or material transfer applications. 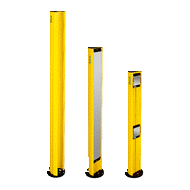 The optoelectronic devices can be mounted to freestanding device columns to ensure hazardous areas are properly safeguarded. Mirror columns are used in conjunction with device columns to deflect the beam from the sender to the receiver. Since multiple sides of a machine can be protected with a single pair of devices, the overall wiring is reduced. In addition to reliable device protection, the device columns have two external mounting grooves, which enable muting arms to be installed.